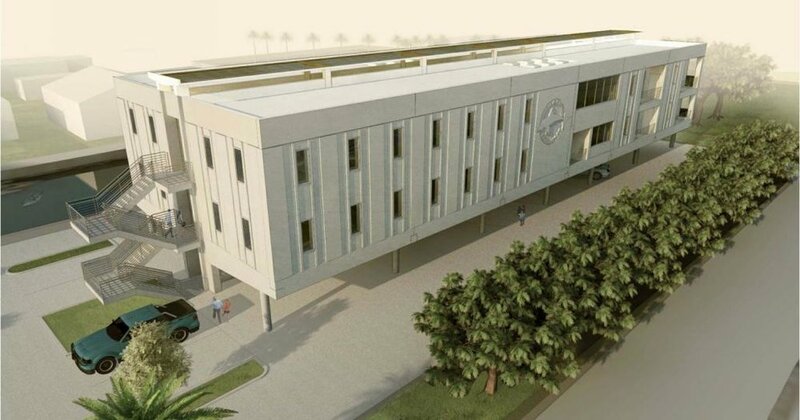 Hall Architects Rendering of the newly completed Mote Marine Research Lab located in Summerland Key, FL. Partners of the project joined by Mote Marine Staff celebrate the buildings opening on May 25, 2017. Snell Engineering’s Cord Van Nostrand served as Engineer of Record (EOR) on the new Mote Marine Tropical Research Lab on Summerland Key. Van Nostrand was engaged and served as EOR at his previous firm. The project is unique in its modular design that was built stateside and transported via boat to the islands for assembly. The 18,000 square foot facility is a 3-story structural precast building with parking below. With sturdy and efficient design, it is both USGBC and LEED Gold certified and able to withstand a Category 5 hurricane. To support Mote Marine’s ongoing research efforts in coral reef restoration, the new Keys facility houses 2 wet science laboratories, 4 dry science laboratories, classrooms, office spaces, and a residential area for scientists, students and executives. The design is complete with a solar array on the rooftop and a generator for additional backup during power outages. Water is harvested at the rooftop and collected for use in a cistern at ground level. Complete in 2017, the new facility looks forward to new research and educational endeavors.